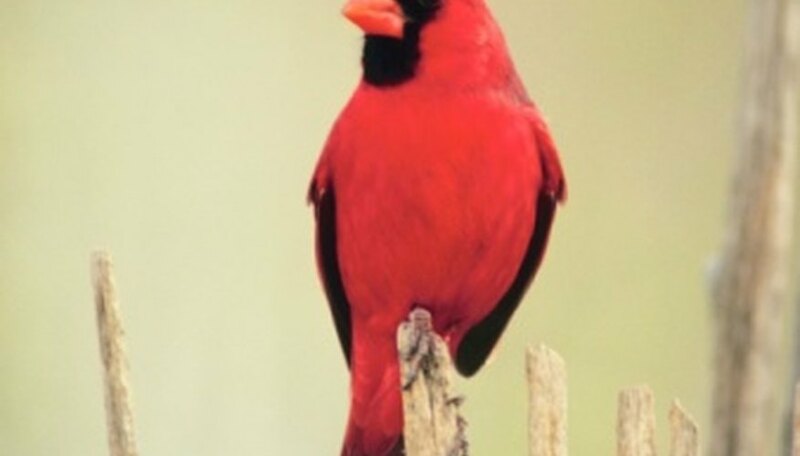 Cardinals are easily recognizable by their bright color and signature crest. Even though the female of the species is more muted in color, her size and shape is very similar to that of the male. The same is not true of their young. Baby cardinals are gray and naked and lack their parents’ pointy crest. However, if you know where to look, you can find clues that will help you identify them. Baby cardinals do not resemble adults. They can be identified by subtle clues such as shape of nest, color of eggs, appearance of feathers, beak and mouth, and of course by the presence of adult birds nearby. Cardinals tend to wedge their nests in branch forks in dense foliage. Hedgerows, pines, honeysuckle, rose bushes, elms and sugar maples are commonly chosen to house nests. A cardinal build its nest in a cup shape made of four layers: coarse twigs, a leafy mat, grapevine bark and a lining of grass, stems, rootlets, pine needles and maybe hair. It measures about 4 inches across, 2 to 3 inches tall and has an in inner diameter of about 3 inches. Nests are generally built 3 to 10 feet above the ground. If there are other eggs in the nest or remnants of the egg recently hatched, they can provide clues as to the species of bird. Cardinal eggs are smooth and glossy. They are white to pale blue or greenish white in color, and speckled with brown, purple or gray flecks. The eggs are approximately 1 inch long and 3/4 inch wide. Cardinals lay eggs in clutches of two to five once or twice a year. The incubation period is 11 to 13 days; in most cases, only the female sits on the eggs, but after the eggs hatch, both parents will bring food to nestlings. A newly hatched cardinal has only sparse tufts of gray down; most of its body is naked. Its eyes are closed. The first set of feathers, the pin feathers, are a rust-brown color. As fledglings, they retain the brown color but gain their characteristic crest at the top of the head. 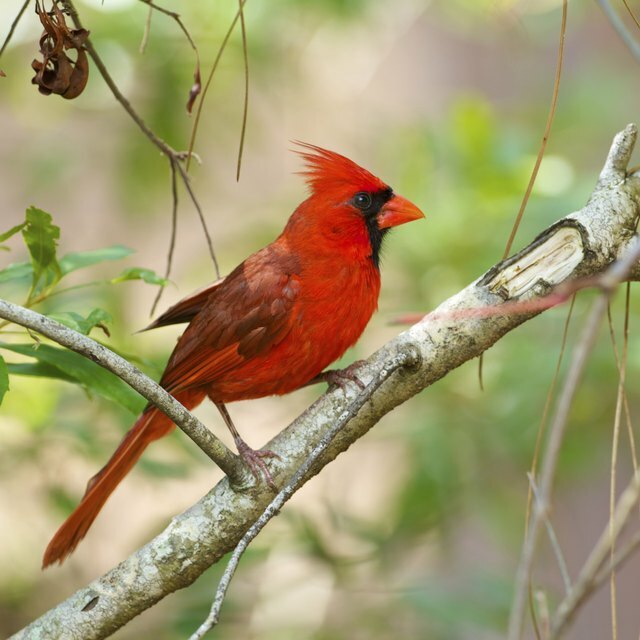 As the birds mature, the feathers will develop the red and tawny colors of the male and female adult cardinals. The shape of the beak indicates what sort of diet the bird will have when it’s older. The gape flanges, where the upper and lower beak join, as well as the inside of a bird’s mouth also differ depending on species. Since they are seed-eaters, cardinal beaks are fairly wide and conical. The inside of their mouths are pink. Immature cardinals have black beaks that will turn orange-red as they get older. The most obvious clue would be the appearance of an adult cardinal in the nest. The female incubates the eggs and continues to sit on the featherless babies for several days after hatching. The adult male has the primary responsibility of feeding the female while she is on the nest, and he continues to feed the young for their first two weeks. However, cardinals have been known to feed babies in nests other than their own, so this is not a foolproof way to identify the babies. Baby cardinals in particular have a tendency to “shiver” when they gape for food. Fledglings first leave the nest nine to 11 days after hatching. The Wildlife Center of Virginia: Wildlife Classroom Series, Baby Birds! Yavorski, Kimberly. "How to Identify a Baby Bird as a Cardinal." Sciencing, https://sciencing.com/identify-baby-bird-cardinal-8260721.html. 13 April 2018.